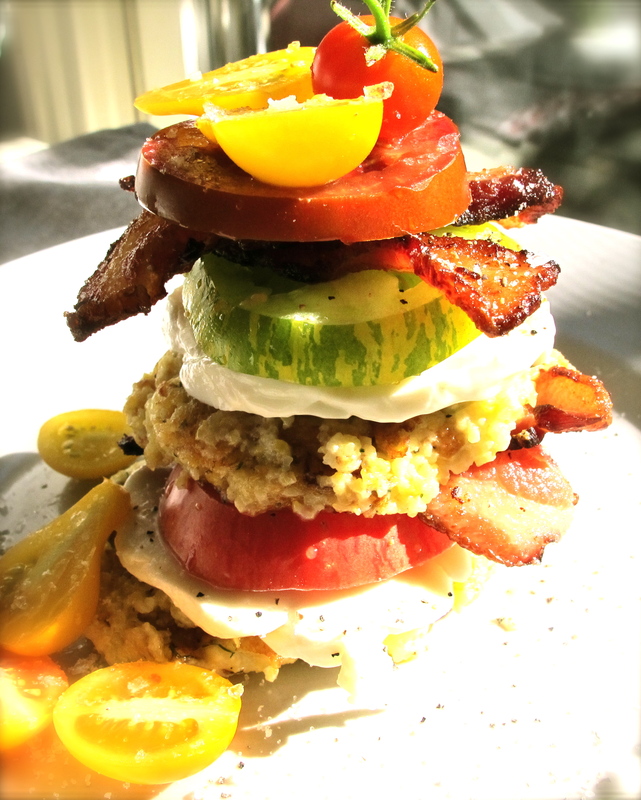 “Breakfast Stack” Sunday morning, 6 am….hungry….a fresh & varied selection of homegrown heirloom tomatoes sitting on my kitchen counter…some thick sliced bacon in the fridge..a BLT? No bread. Hmmmmm. I do find, along with the bacon, some fresh mozzarella, some leeks & fresh dill…still…no bread. Polenta? 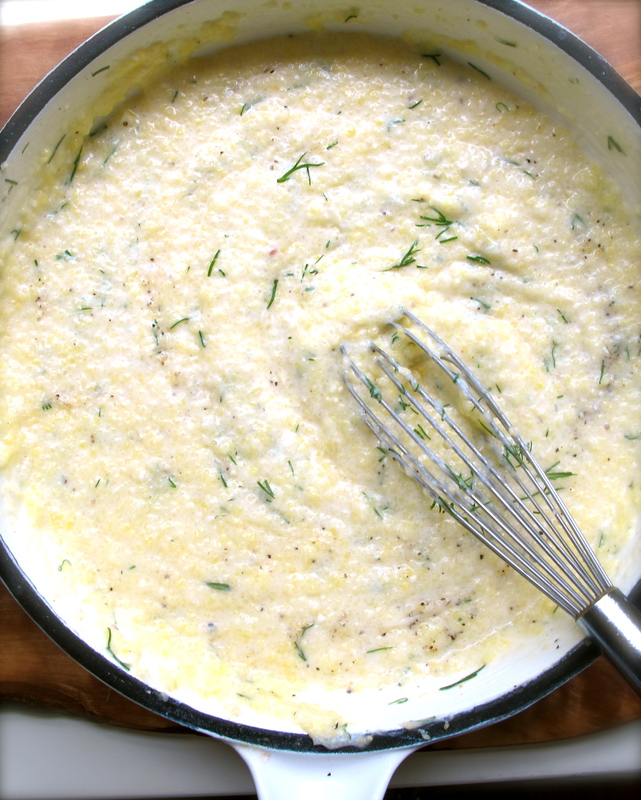 Yes, I have polenta and can make some quick polenta skillet cakes…eggs? Yes, I have eggs from the West Nashville Farmer’s Market. 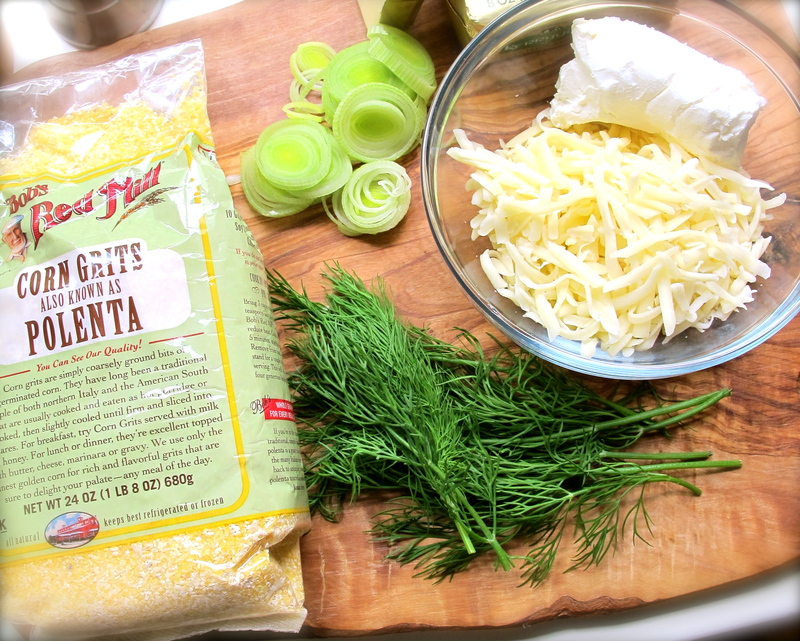 1 cup polenta, 1.5 cups water, shredded Gruyère cheese (or whatever cheese you have), a hunk of cream cheese would be nice, 1/2 cup thinly sliced leeks, some fresh dill, butter, salt & pepper to taste. 1. Add the water to a pan & bring to a boil. 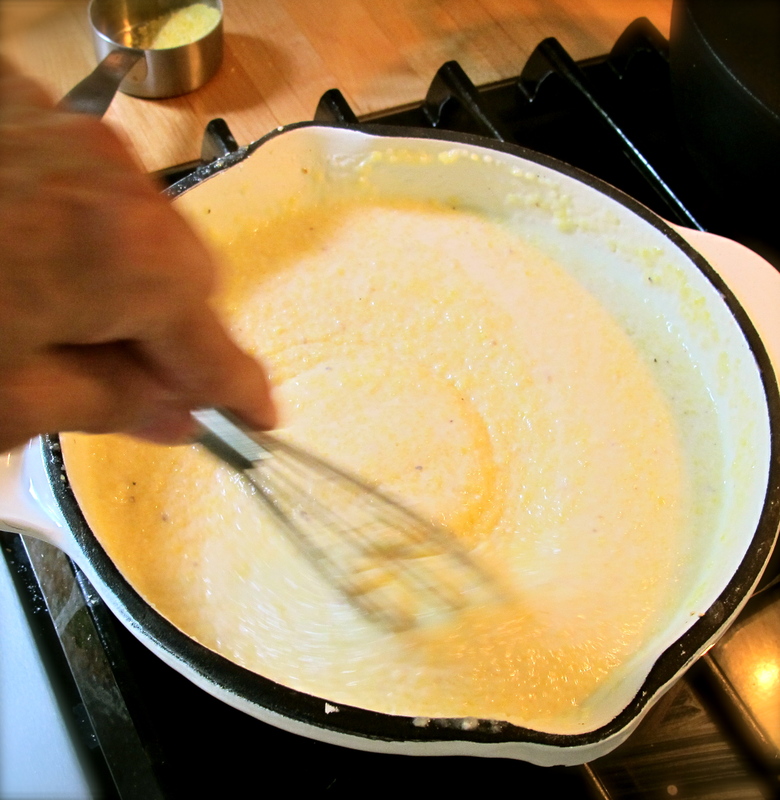 While whisking, pour in the polenta. Turn heat to medium & continue to whisk & cook until polenta mixture begins to thicken which will take a few minutes. 2. Add the remaining ingredients whisking to blend. Remove from heat. 3. Let polenta mixture sit for about 15 minutes to cool somewhat while you prepare the remaining ingredients. 5. Spoon large dollops of the polenta mixture into hot skillet cooking until a bit crusty and brown on both sides. 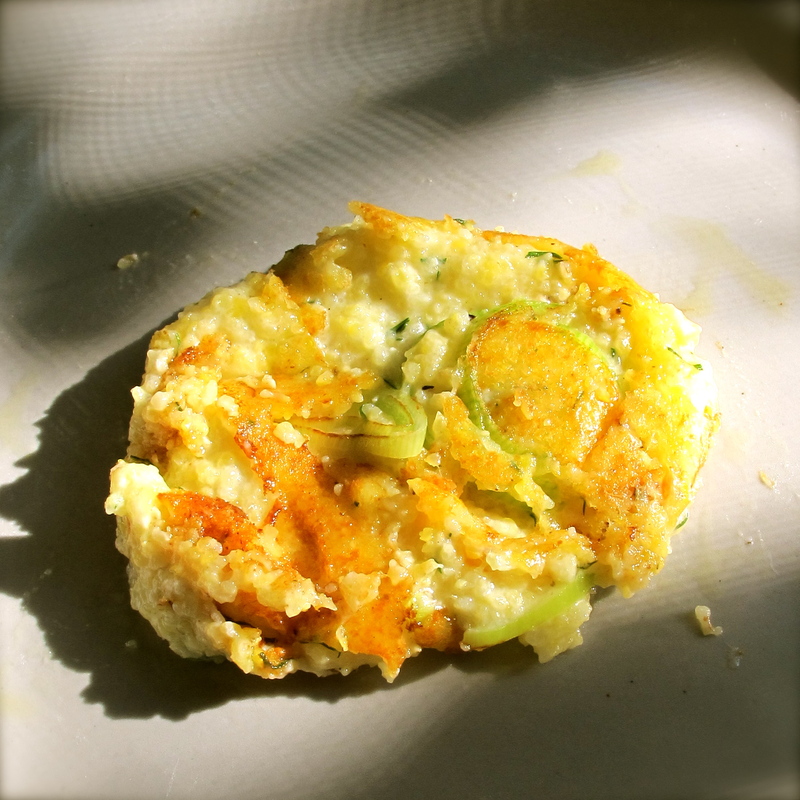 Note: these skillet cakes will be soft, messy but that is okay. Just work the hot polenta dollops into “cakes” using your spatula. When crispy on the outside remove to a sheet pan and place in warm oven until all skillet cakes are done. 7. 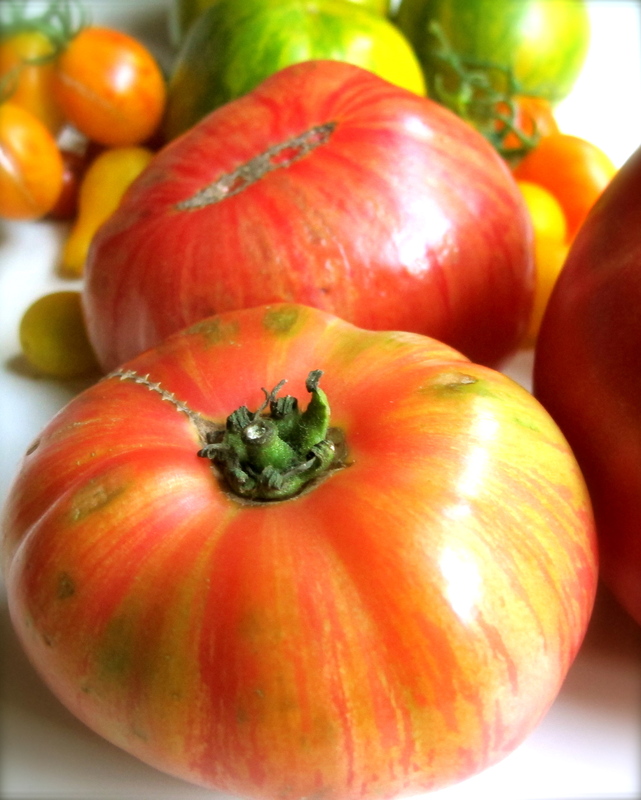 Choose some ready-to-eat homegrown tomatoes to slice. 8. To Serve: Place one of the Polenta Skillet Cakes on each plate. Top with a thin slice of Mozzarella. Add a slice of tomato & then one slice of crispy bacon cut into two pieces. Repeat layers ending with some tomato slices, a dusting of sea salt & cracked black pepper. Eat with a knife & fork. It’s okay to let the stack slide over to eat! Alternative: Fry up an egg. Slice an avocado. Add these to the top of stack along with a few tomatoes. Hmm, that looks impossible to eat it’s stacked so high. I consider a challenge! Dang, that looks like some seriously good eats there! We keep it simple, spontaneous and seriously fun when we cook down here in Nashville. Thanks for the comment! Yummy and gorgeous. 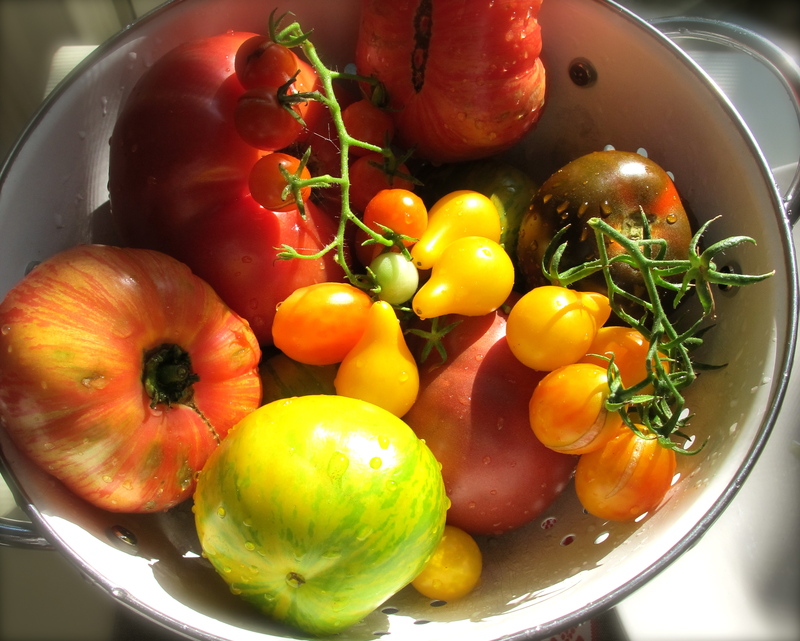 Tomatoes here haven’t been as wonderful as those look this year. Another work of art. Nancy, when and if you come in September we will conjure up something good together to blog about! 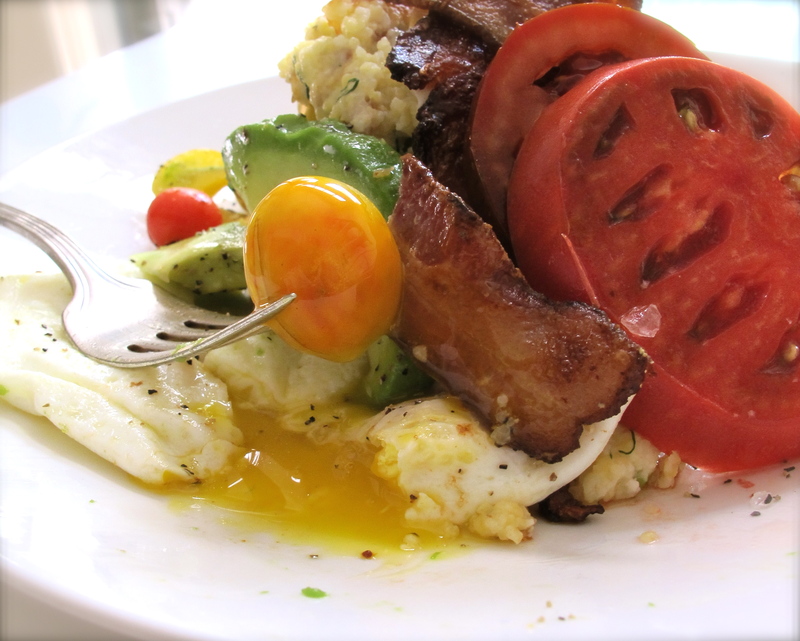 yes, I can clearly count 5 pieces of bacon….lol It looks great, beautiful photography as always! 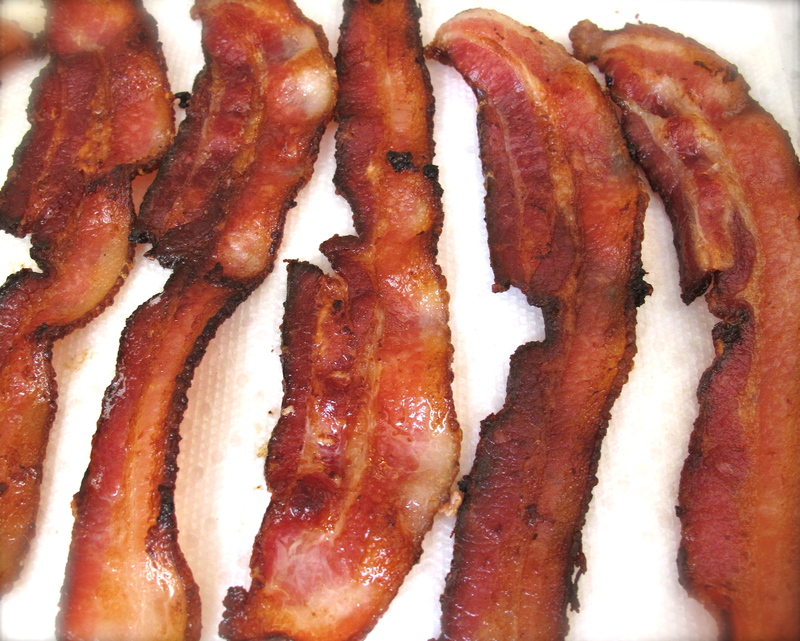 Now, now Stephanie…FYI…I cut each of two pieces of bacon in half to make 4 halves….Thanks as always for stopping by and your sweet comments. Hey to Billy. So does your rolled cake! Lovely. wow, teresa…that’s a beautiful stack!!! Barbara, you are so sweet to check my blog…yes that was a fun stacked breakfast…not a big as the photo made it out to be…Wouter returns in 2 weeks so I will make him a celebratory breakfast stack. Love to you and Johan. BEAUTIFUL I ESPECIALLY LIKED THE IDEA OF THE POLENTA CAKES. How did this post almost escape my notice? 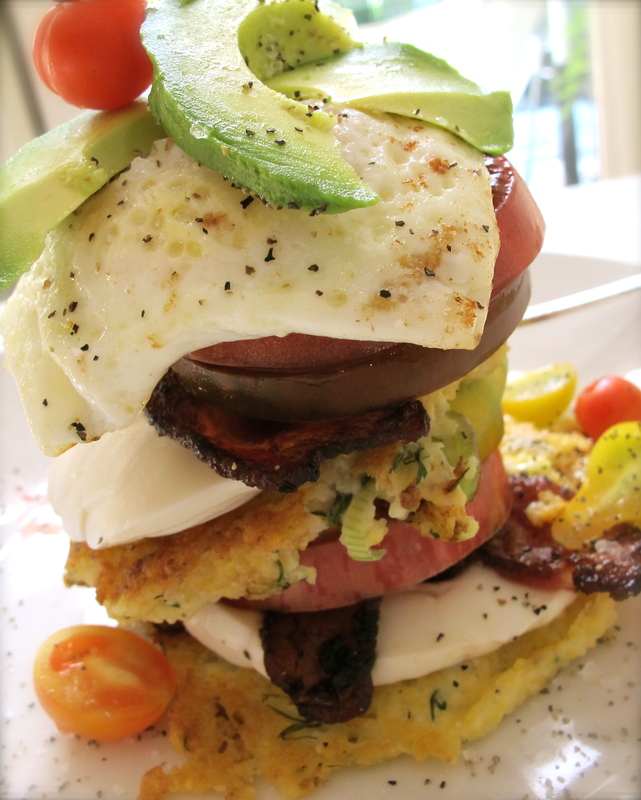 Polenta cakes—the perfect solution.Stack those tomatoes skyward! I love Lady Cream Peas! But here in Texas they are almost impossible to fine. I like to add powdered chicken bullion to them as well as butter, salt and pepper. mix mayonnaise, softened butter, parmesan cheese, and chile powder together. Spread on roasted corn on the cob. It doesn’t get any better than that! Oh that corn sounds so delicious. I have had corn like that in Mexico on my travels and I think it is one of the best ways ever to eat fresh corn. Thanks for sharing. Lady Peas are only here at the local farmer’s markets for a month or so and after that we all have to wait until the next year. I like having to wait and anticipate and think about how delicious they are. I appreciate your stopping by. After having read your title and seeing that serious stack of goodness…you sure weren’t exaggerating Teresa. Hey There, you are right. 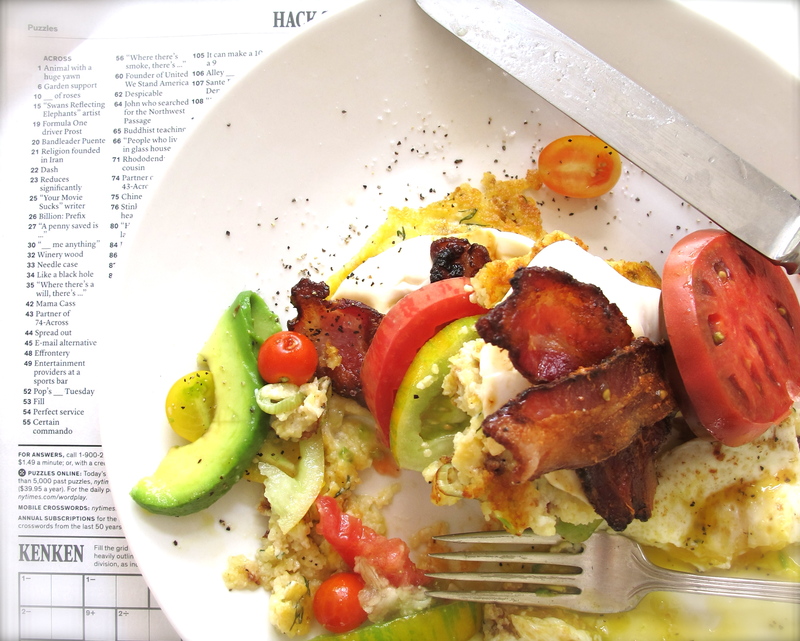 This stack is the breakfast of champions…Thanks. 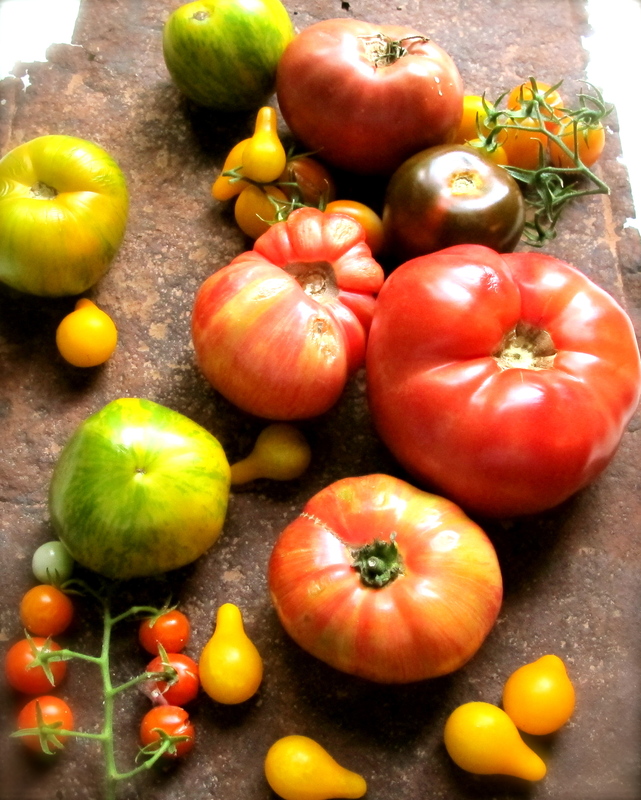 I have heirloom tomatoes and overnight guest coming for a visit. This sounds wonderful and looks beautiful. If I serve this to them, they might not want to leave. Just love your blog…so happy to have discovered it.